On October 25, the Communications and Technology Committee of the International Association of Chiefs of Police met for what was the last meeting chaired by Chief Harlin McEwen. McEwen, the retired Chief of the Ithaca Police Department and a former Deputy Assistant Director of the FBI, served as the chairman of the committee for 37 years. He is an Honorary President and Life Member of IACP. McEwin was presented with the special “D Block” to commemorate his efforts to convince Congress to allocate the potion of the 700 MHz band (called the D Block) to public safety, making the FirstNet system possible. Outgoing committee chair Chief Harlin McEwin (center, with D Block). To his left is incoming chair Chief Eddie Reyes; next to Chief Reyes is Lou Fiore, chair of CSAA’s Alarm Industry Communications Committee. (Click image to enlarge). Security industry professionals explored their leadership styles, received tools and insights for dealing with health insurance trends, crisis communications and cyber security, and discussed technology trends and legal issues last week in Sonoma, CA. 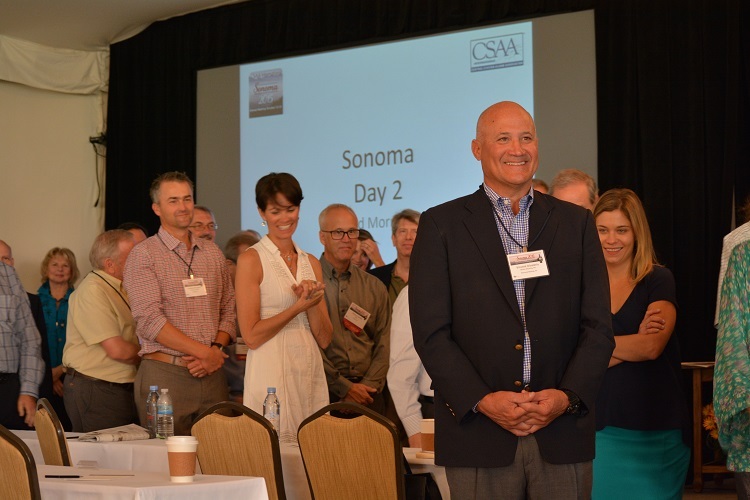 The 2015 CSAA International Annual Meeting garnered rave reviews from attendees, who attended at the highest rate since 2008. CSAA Annual Meeting participants at Dr. Robert Rohm’s interactive leadership session, “Why Can’t You Be Normal…Like Me!” Photo by Brandon Freedman. With the goal that attendees would have an experience that added value to their business, CSAA assembled a roster of expert presenters to share information to help members change and improve their business practices. So strong was the participation throughout the education sessions that the room was still full for the last session on the last day. 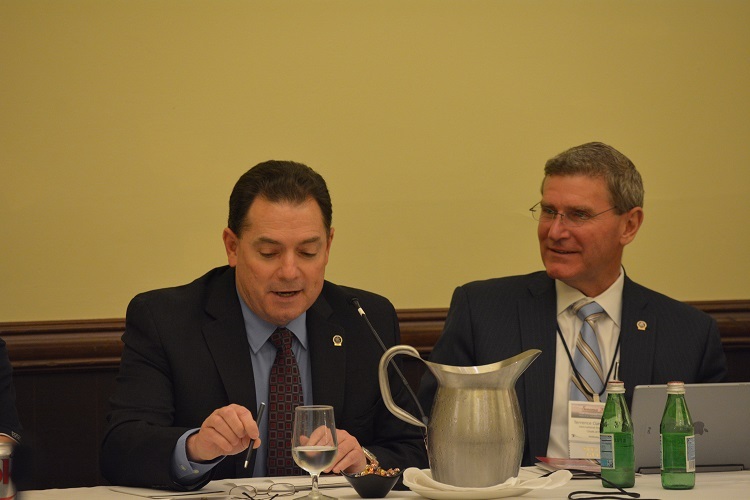 Richard Beary, president, International Association of Chiefs of Police, and Terrence Cunningham, first vice president, IACP, participate in the AHJs luncheon with CSAA members. Photo by Brandon Freedman. A unique aspect of the CSAA Annual Meeting is the presence of Authorities Having Jurisdiction (AHJ) representatives. The 2015 event included the largest representation of AHJs in several years, including Chiefs of Police, Fire Chiefs, and Sheriffs. These groups were allotted time to meet separately by themselves and with the CSAA members, so that they could engage with each other and then bring their own unique challenges to the attention of the alarm industry. At the event, CSAA announced that the 2016 Annual Meeting will be held at the Marco Island (FL) Marriott Beach Resort, October 22-27. “We will continue to build on 2015’s success for the 2016 Annual Meeting and welcome comments related to content and format,” said President Petrow. 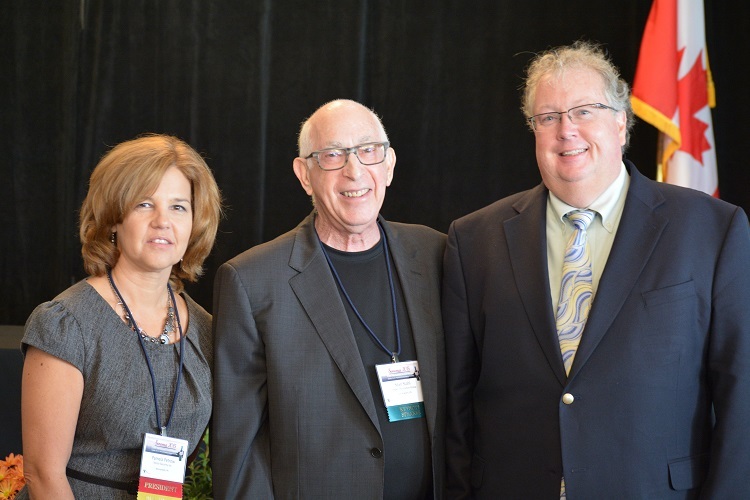 CSAA President Pam Petrow, Keynote Speaker Stan Stahl, Ph.D., and CSAA Executive Director Jay Hauhn. Photo by Brandon Freedman. Meeting the Information Security Management Challenge: The Financial Implications of Cybercrime on the Alarm Monitoring Industry — Stan Stahl, Ph.D.
Legal Concerns in a Tech-Crazy World Speaker: Charles C. Eblen, Esquire, Partner, Shook, Hardy & Bacon, L.L.P. The Communications Landscape Speaker: Syed Zaeem “Z” Hosain, Founder, SVP Engineering and CTO, Aeris Communications, Inc.
On October 21, the Security Industry Alarm Coalition (SIAC) announced a program to raise awareness of the continuing need to foster strong relationships between the electronic security industry and law enforcement. SIAC has strong support among industry leaders and is seeking to broaden its funding sources to continue its program of working with the approximately 18,000 law enforcement agencies throughout the United States. Since 2004, SIAC has had the unique and vital role of being the one voice for the electronic security industry with law enforcement and elected officials. SIAC is the only entity focused 100 percent on ordinance activity and alarm management education in North America, promoting a well-vetted model that provides reasonable best practices that ensure our ability to serve our customers and grow our businesses. This structured, efficient approach avoids political controversies and costly litigation to fight or overturn ordinances that are costly and burdensome to the industry. 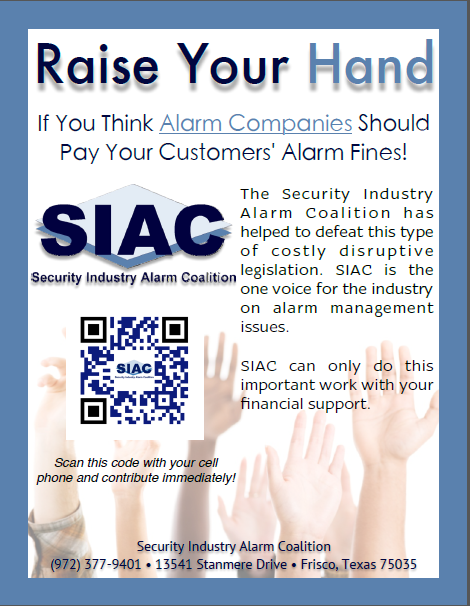 More significantly, SIAC has worked with the International Association of Chiefs of Police and the National Sheriffs’ Association to create model alarm ordinances that significantly reduce alarm dispatches. CSAA is a committed supporter of SIAC. More information on how to support SIAC’s efforts can be found at www.SIACinc.org. CSAA President Pam Petrow, president and CEO of Vector Security, is one of the featured presenters at the Security Industry Association (SIA)’s Securing New Ground® (SNGTM) at the Millennium Broadway Hotel in New York City. The event is coming up fast — October 28-29. According to SIA, Securing New Ground® (SNG) is about the “business of security. At SNG, C-level executives, new entrants, investors and security practitioners discuss and map the state of the security industry.” Participants in SNG will gain access ​​to unparalleled networking opportunities and valuable industry information, presented by ​​​market leaders sharing relevant industry information, not sponsored content. Petrow will participate in a panel titled “Market Leaders Perspective: How Established Companies Stay Nimble and Relevant.” In her session, she and moderator Kirk McDowell, Vice President, Platform Sales, alarm.com and co-panelist Tim Whall, Chairman & CEO, Protection 1, will discuss how successful companies grow and evolve over time. They will address how technological and industry shifts, the threat of new entrants, understanding your market and your customers’ aspirations, globalization, changing government regulations and more require companies to stay efficient and innovative to keep ahead of their competitors. Get the App! Our mobile guide will enhance your experience at the 2015 CSAA Annual Meeting. If you can’t attend the meeting, you can still follow the action! To get the guide, download ‘Guidebook’ from the Apple App Store or the Android Marketplace, or visit http://guidebook.com/getit from your phone’s browser. Then, from the Guidebook application, tap “Download Guides” then “Redeem Code”. Enter the code 5fu79y23 and the guide will download to your device! CSAA board member Shannon Woodman, COO of Washington Alarm in Seattle, Washington, is the newest member of the CSAA Board of Directors’ Executive Committee. She joins the committee at the invitation of the president, in the role of Special Advisor. As the 3rd generation in an alarm company family, Shannon Woodman grew up in the security industry. She came to work full time for Washington Alarm in 2000 as a sales representative and quickly worked her way up to Sales Manager. In 2011 Woodman officially took over day-to-day operations of the company from her father, becoming Chief Operating Officer. Want to receive news from CSAA? Subscribe to our blog or sign up for Signals, our biweekly e-newsletter.